Qantas will drop flights to Dubai and bring back a Singapore stopover for travel to London as it seeks to renew its alliance partnership agreement with Emirates for a further five years. Under the new flight schedule that will begin on March 25 2018, Qantas will end its daily Airbus A380 Sydney-Dubai-London Heathrow rotation, with QF1/2 to instead operate on a Sydney-Singapore-London Heathrow routing. Qantas is also upgauging its daily QF35/36 Melbourne-Singapore flight to the A380, from A330 equipment currently, and increasing its schedule on the route to double daily, from 10 times weekly now. The airline announced previously the end of its Melbourne-Dubai-London Heathrow service in March in favour of a Melbourne-Perth-London Heathrow offering. Emirates will not codeshare on the Singapore-London and Perth-London services due to traffic rights restrictions. Qantas chief executive Alan Joyce says the network changes were an evolution of the partnership with Emirates. “Emirates has given Qantas customers an unbeatable network into Europe that is still growing. We want to keep leveraging this strength and offer additional travel options on Qantas, particularly through Asia,” Joyce said in a statement on Thursday. The network changes will form part of Qantas and Emirates’ application to the Australian Competition and Consumer Commission (ACCC) for a five-year extension to their existing alliance, which commenced in 2013 and resulted in Qantas shifting its European hub from Singapore to Dubai. Emirates president Sir Tim Clark said the alliance had been a success for both carriers. “Together we deliver choice and value to consumers, mutual benefit to both businesses, and expanded tourism and trade opportunities for the markets served by both airlines. We remain committed to the partnership,” Clark said. 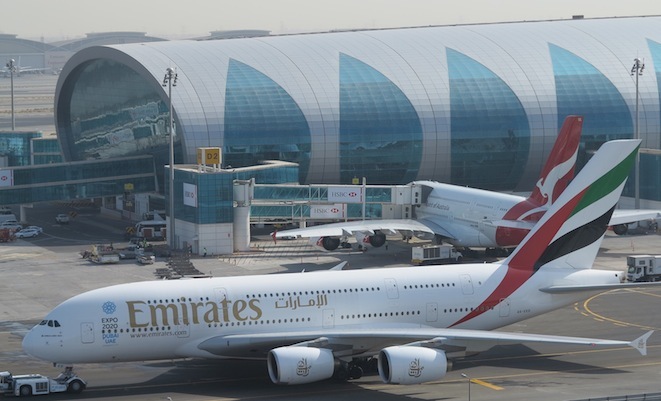 Clark said Emirates would shortly announce more details on offering an “even stronger product proposition for travel to Dubai, and onward connectivity to our extensive network in Europe, Middle East and Africa”. The Qantas move to end flights to Dubai comes as consumer surveys have overwhelmingly indicated a preference for an Asian stopover rather than one through the Middle East en route to Europe. Giving Qantas passengers a choice of Dubai (on Emirates equipment) or Singapore (on Qantas aircraft) for a stopover to Europe mirrors what Virgin Australia already offers travellers through its partnership with Singapore Airlines (SIA) and Etihad Airways. Although Virgin Australia has never flown to Europe, it too ended flights to its alliance partner Etihad’s Abu Dhabi hub in February 2017. Of course, Qantas is also starting Perth-London Heathrow services in March, linking the continents Europe and Australia nonstop with regularly scheduled flights for the first time. “Improvements in aircraft technology mean the Qantas network will eventually feature a handful of direct routes between Australia and Europe, but this will never overtake the sheer number of destinations served by Emirates and that’s why Dubai will remain an important hub for our customers,” Joyce said. Last week a big management reshuffle. This week a major change in route structure! Has there been a coup in the senior ranks at Qantas? Something major must have happened to cause this dramatic chamge in policy! Looking at the Qantas promotionional video it seem they are returning to the pre dubai days of hubbing in Singapore. Links shown to Singapore from Perth,Melbourne, Sydney and Brisbane. QF 35/36 probably go on to Paris or Frankfurt. Maybe even 737s from Broome, Port Headland and Alice Springs. 787 or A330 from Canberra! Whatever happens this decision is going to be very popular with passengers! Emirates can add more flights to Dubai now, can’t they? I don’t think they have reached their new maximum—could they take over the time slots for QF1/2 out of Australia, for example? I wonder how much congestion at Dubai and it’s resulting consequence of QF 1 missing it’s slots at LHR has been a factor. Less congestion at SIN. Thankfully the A380 isn’t completely dropped from Melbourne, in so happy about that. I think Singapore is the better option anyway. I like the drip feeding of information a new peice of the jigsaw every other day or so.. I am sure the congestion in Dubai plus a good deal from Singapore Airport with so many flights now going there has meant good economies for being based there. The next drip of information will be where the second set of 787s beyond LA and NYC. Another question is will there be another tranche of 787s for the Perth Europe service or will they wait until the CAPEX on the A380 refurbs is done. So no more 787s until 2020. We shall see!! @David McGrath The article said that one of the drivers for the change was customer feedback. About time Qantas realised how popular the Singapore route was. Better late than never but was a wrong decision to have dumped it. Will be harder now to regain passengers from Singapore Airlines who still offer better frequencies, more routes and better cabin service. SIA offering A350 flights from Brisbane so when will Qantas route their 787 BNE to SIN? 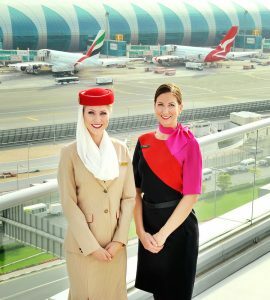 I always wondered why Qantas didnt have feeder flights from Brisbane and other major centres to connect with Heathrow services at Dubai to maximise the capacity on the London legs. These changes will At least give people from most capitals the chance to connect to London on QF hardware without backtracking to Sydney or Melbourne. A good move I feel. Now lets hope the feeder flights arent sardine tins like the 738’s. It is obvious now that the new Boeing 787-9 flights from Brisbane are likely to route LAX-BNE-PER-CDG/FRA. My bet is that it will be CDG. If both this route and the LAX-MEL-PER-LHR route works, I bet we will see a LAX/ORD-SYD-PER-CDG/FRA soon with another 4 787-9s. My hopes are high, but I’m hoping this influence back into Singapore could bring the speedbird back to Melbourne. Any predictions about future routing are just that and pure speculation…. but they are fun! My bit? Emirates are desperate to get into TXL but the German government won’t give them any more locations to fly into. Somehow, there has to be a way to use a QF 789 to go via DXB from somewhere in Australia. Perhaps (as a code-share) BNE – SIN – DXB – TXL? This would be even more viable as Air Berlin is on the way out leaving passengers from AUH needing a direct route (with a short taxi ride included). Not withstanding QF to LHR via SIN is a welcome return! If I had a choice in doing a stopover in either Singapore or Dubai, well, it’s a no brainer. Having just returned from Austria (via Dubai) let’s be honest, other than flashy buildings and shopping malls what really does Dubai have to offer? As for Singapore, you can easily spend a few days there enjoying it’s highlights. The reality is many people are changing their flying habits. Instead of attempting to fly somewhere as quickly as possible and then spending 2 days to recover, a stopover for a couple of nights is becoming an attractive option and Singapore is the perfect stop to do just that. Qantas are really on the up and setting the pace again. Great to see. Hope there is more to come. Thank goodness dropping that dreadful 2 hour stop over in Dubai. SIN is a standout stopover over Dubai and it may even encourage more to take a real stop over at a place that offers so much more than glitzy shopping malls and sand! As the BNE LAX 787 will then continue onto JFK and then back to LAX and BNE, given the regular delays on the current service, can’t see a reliable schedule, if BNE PER CDG or FRA is also added on! Reckon BNE DFW BNE more likely? I must be the only one who loved the change to Dubai. Re-boarding at Changi is an absolute uncontrolled rugby scrum, compared with the sophisticated reboarding process in Dubai. I will really miss the Dubai efficiency and am seriously cosidering changing my allegiance when flying SYD-LHR, which I have done 70 times in the last 5 years. QANTAS has certainly not listened to my feedback! I wonder if Emirates’ “even stronger product proposition for travel to Dubai” might be a direct flight from Canberra, to compete with the service which Qatar are set to launch next year (Gulf politics permitting). If so that would be very attractive to me, a Canberra resident, rather than backtracking to Sydney – even though I prefer Singapore as a stopover spot, just like everybody else. Over 500 comments on Qantas’ Facebook page and nearly everyone positive about the move! Maybe someone in Qantas has finally started listening! Now they need to take note that people want connecting flights from Adelaide Canberra Townsville Cairns and Darwin to Singapore. There’s also a lot of people wanting Singapore- Frankfurt service. Hope that person at Qantas reads all the social media feedback! @ Arkair what research have you done that shows there is sufficient demand for the services from Adelaide etc to Singapore? Comments on facebook is not research. Don’t forget the SIN-CBR connection too that SIA currently provides. Could be interesting for CBR pax returning from London with Qantas to jump on SIA to CBR rather than going through SYD and ending up on a squashy Dash 8 SYD-CBR. I bet the Qantas techos are happy too … no more sand blasting of their engines! Fair enough that i am going off social media however Market researchers, business, governments and statisticians regard 1 letter or comment as representing the opinion of 5,000 people. There has been a strong campaign going on in South Australia,including from SA government, for Qantas to resume international services from Adelaide. I work in the transport field and have some expertise in this area. this is really pathetic ! So all SYD & MEL passengers who were able to fly to almost any major or secondary destination in Europe, Africa or Mideast with only one transit i DUB, now need to stop in SIN, then connect to DXB then to their destination. Or stop in SIN, then connect in LHR then to their destination. Absurd !! Qantas keeps bragging about nonstop Pert-London, but if you’re originating in SYD or MEL, then you still need one transfer in Perth and one in LHR. So where was the logic in stopping the Dubai service ? In typical Airline fashion, a change for the worse is presented with a spin on it, to make it sound like its a change for the better, Anyone else see what i’m seeing ? Well, Perth has been duped once again ! The much heralded new PER/LHR direct with the 787 next March has sneakily been ”downgraded” to a MEL/LHR via PER, because thats what it will actually be. So I’d say all those WA travel agents expecting to be able to have sole sale on all the 236 seats, will now find that it will be jointly, and probably not fairly,, distributed between the MEL and PER agents. Then all this ridiculous hoo ha from WA tourism people about the new service ” creating 10,000 new jobs” is just that, absolute nonsense. Hope QF will be setting up engineers in say ATH or FCO when the PER/LHR flight is battling those seasonal headwinds and needs to drop in for a top up! Yes, good move to return to SIN instead of DXB, been through both DXB and DOH recently and now going back via SIN next month, much nicer !!! Having being a “frequent flier” since leaving Sydney in 1992, moving to regional NSW locations and seeing the Dynamics of market share and technology advancements I offer the following comments. The decision to “drop” Singapore (& Bangkok) from it’s through flights to LHR was curious, however to embed the allaince with Emirates, understandable to a point, only to a point. My hope is that Aussie crews are employed on the Sin/LHR sector, as it was LHR UK hired staff completing that leg, doing Aussie Cabin Crew out of a job. Not playing nice Alan! In regard to fleet allocation, having done some basic maths, the venerable 748 ER equipment is actually cheaper to run than the A380 on a CPK basis per person carried. The only drawback is the Dallas East Coast, I have done the trip in both aircraft types (748 er to Bris/Syd & 380 DFW/Syd) 16.5 hrs of which mild turbulence for 8 hrs of the trip was interesting, but tolerable. QANTAS, MUST explore the Sub Continent and Middle Europe ie France, Germany, Italy and other destination, in particular out of Perth with the new “Big Twins” coming on line. The A330 equipment with some slight aircraft reconfig, can do 10 to 11 hr sectors standing on it’s head and should be used into Asia and also bring back a user friendly Syd/ChCH sector, as was the case until Emirates came on board. QANTAS, although alliances are good, must expand the core route structure, again to remain a top 10 international player. Why is Tahiti not serviced anymore? I think that retaining 8 to 10 B747 airframes is essential as the A380 need substantial maintenance and the reliability has been problematic for an aircraft that has now been doing RPT for 8 years. Another idea if DFW/Syd is a bit thin, then do 4 A380’s and 3 747 weekly. We do need more direct presence into North US and San Fran is a good ida, perhaps another routing for the 350’s or 787’s, particularly out of Brisbane. about time too.I have done the UK TRIP but on SINGAPORE AIRLINES in 2011 and had the singapore stopover on the way home.shopping,food and sightseeing was just amazing.granted at work we do the contract for emirates and qatar economy and business class for the cutlery,serviette,salt/pepper,stirrers and sugar for them It’s for a disability enterprise but I wouldn’t fly those airlines.my choice would be singapore airlines or qantas or even ba if i go again. SIN is a great airport but talk about back to the future. This will leave the QF/EK alliance in tatters or at the very least fragment it. What’s the point of having this great big advantage of a one stop in Dubai to get to everywhere else in the world if you can’t get to DXB on a QF aircraft. The PER-LHR ‘game changer’ is still a one-stop for people travelling from the East coast. If you look at the great circle route from SYD-LHR, it flies almost directly over Hong Kong. It’s a pity QF don’t have a closer relationship with their oneworld affiliate CX. If they did, they could set up a strategic partnership with them to codeshare on CX services to European destinations if people didn’t want to fly to LHR. CX are offering an expanded service to Europe, including BRU, DUB and CPH from next year. Not to mention everywhere else they fly. Also QF could codeshare on BA flights between HKG-LHR to give people even more choice – and all happily within the oneworld alliance. QF1 and 2 would be SYD-HKG-LHR return. Have QF9 and 10 as MEL-HKG-LHR return. Maybe even relaunch services to the continent SYD-HKG-FRA return on QF5 and 6. Just like old times. QF and/or JQ could also become innovative and launch CBR-HKG, DRW-HKG, TSV-HKG, OOL-HKG, or even HBA-HKG, once the runway extension at HBA is finished. Then there would truly be one-stop choice between every major Australian city and Europe. Still keep PER-LHR direct but under a different flight number and standing alone as a true game changer. they could renumber the per/lhr 787’s as qf5 and qf6 from next year.that service which was sydney to singapore gets dropped from next march or april. I agree with you Ben. I wish Qantas had a proper relationship with CX. While Singapore is great, my preferred stopover is always Hong Kong. When I go to Europe these days I fly Finnair (QF or CX) from BNE to HKG then onwards with Finnair. CX is expanding into Europe which is great, but Finnair has you covered for all of the other European cities and you clear EU customs in Helsinki. It’s awesome. Why doesn’t Qantas just work properly with its OneWorld partners CX and Finnair? A proper hub in Hong Kong has surely got to make more sense than even Singapore. QF passengers can get to Hong Kong from everywhere (including Adelaide and Cairns) on QF or CX, then they could hub through there to either Europe, Asia or India using their own aircraft to UK, CX and Finnair to Europe and CX to China. @Peter Hannaford, you claim to have changed airline allegiances 70 times in the past 5 years?!! Seriously?! Perhaps you should start by looking in the mirror? Maybe YOU are the one airlines can never please? I sincerely wish you well in finding your niche airline and soon. Travel well my friend. An A380 sat on the ground for 14 hours at Heathrow every day is not good utilisation. Swap a slot with Emirates and return ASAP to arrive in Sydney 2100 ready to go to sleep. @JR – I’d forgotten about Finnair. Of course, another oneworld partner that QF could team up with. A quality airline with an impeccable safety record as well. Add that to CX and BA and you’d give passengers a lot of choice to Europe. The only oneworld airline they seem to be interested in working with though is AA. The direct flights to DFW work – It’s an AA hub and it makes sense. They can get North America to work – why can’t they do the same with Europe. If they’re in the oneworld alliance, why not maximise the potential. Instead they persist with EK, which isn’t going to work long term if you don’t have QF metal flying into DXB. Rather they’re going to be overflying DXB when the PER-LHR nonstop starts up. There would really be no reason for QF passengers to fly to DXB at all once the changes are in place, unless they wanted to go with EK all the way. Which nullifies the reason for a partnership in the first place. The only real winner out of that would be EK. It has quite often been said that QF and CX have never had a close relationship and despite being in the same alliance they’re actually rivals. I can’t see why though. CX is a quality airline and HKG is a first class hub. @JR you’re quite correct! Finnair are a superb airline! Brilliant service with a beautiful and efficient hub! Helsinki itself is a stunning city and the flights from there into the rest of Europe are incredibly convenient. Hubbing through Singapore and/or Hong Kong and onto Helsinki is a great alternative to Dubai. Thai Airways and Singapore Air plus subs Scoot and SilkAir increase their frequencies into Australia. Could this be the reason why Qantas has made this decision after previously turning its back on SE Asia. Emirates does not have the approvals for more flights to SE Asia so Qantas is not required to “share the spoils”. I have not forgotten the reduced flights to SE Asia by Qantas in recent years. @ Ben … Thanks for your very informative, intelligent analysis. Great Circle through HKG is significant, and it’s an interesting place for stop-overs. CX are undeniably one of the top 5 airlines in the world at the moment, and that is a long-standing, hard-earned, well-deserved reputation (like QANTAS used to have), so partnership with them should be a positive for QF. CX already train pilots at FTA in Adelaide, so some good rapport with Australia. Mike, sorry, you have misinterpreted my comment. Perhaps my sentence structure was unclear. I have flown LHR -SYD 70 times in the past 5 years. I have flown QANTAS almost exclusively, but occasionally BA. My comment referred to the difference between Changi and Dubai when reboarding the arcraft. SYD-DXB is 6501 nm DXB-LHR is 2973 nm. Total 9474. That’s 286 nm longer than the shortest direct distance. It might not seem like much on a marathon journey, However on average airspeeds can probably save well over half an hour on the total journey time for passengers. I know other factors like airport congestion, enroute weather etc, probably need to be taken into account as well. DXB is generally going to be more congested than HKG though. From an economical point of view though, I wonder how much less fuel you could save and cost saving you could get by going through HKG?